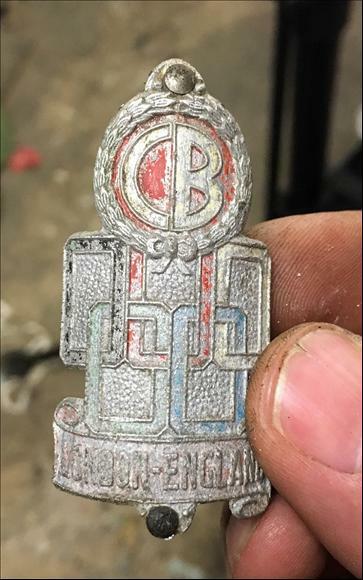 This head badge found on a 1952 Massed Start is interesting on two counts, 1st its cast in an aluminium/alloy rather than pressed tin, 2nd the rings are in yet another colour configuration (yellow top right) the badge is very light and has fine cast detail, perhaps reserved for the very top of the range model such as the Massed Start? One of the giants of the British cycling industry, Claud Butler was no one man shop, but rather a large manufacturing business which turned out large numbers of frames. They produced everything from track and racing frames as well as tandems in both lugged and fillet brazed varieties. The Claud Butler name and trademarks were purchased by Holdsworth and frames carrying the Butler name were simply rebranded Holdsworth frames. In the late 1980's a conglomerate which also owned Falcon purchased the naming rights for Holdsworth and Claud Butler and reintroduced the name.